Neck pain is defined as pain in the area between the base of the skull and the first thoracic vertebra. Pain into adjacent regions is defined as radiating neck pain. Pain may radiate into the head (cervicogenic headache), shoulder, or upper arm (radicular or non-radicular pain). Neck pain is common in the general population. The 1-year prevalence varies between 30 and 50 %. It is more common in women with peak prevalence in middle age. Risk factors include genetic predisposition and smoking. The following innervated structures in the neck can be a source of pain: vertebrae, discs, uncovertebral (Luschka) joints, ligaments, muscles, and facet (zygapophyseal) joints. 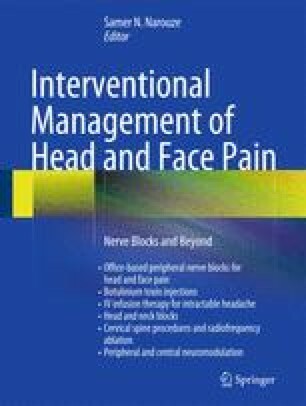 Knowledge of the innervation of various structures in the neck is important for the interpretation of diagnostic blocks and deciding on target-specific interventional treatment.